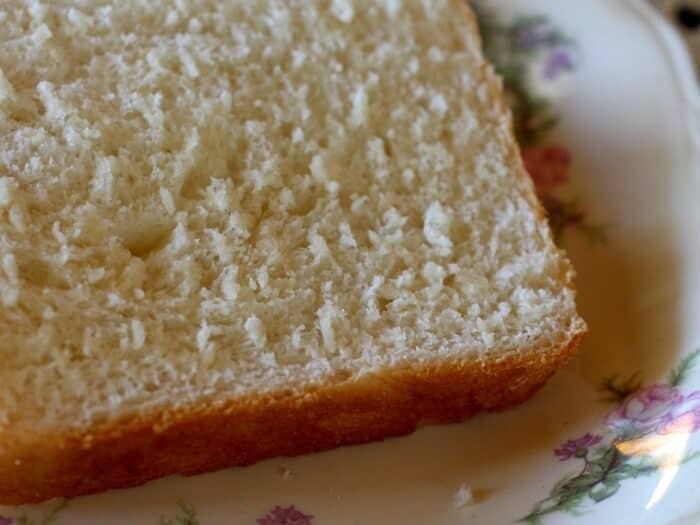 Easy Amish White bread recipe is a sweet, velvety-textured, homemade bread that’s perfect for sandwiches. You can make it by hand or in a bread machine – both instructions included. It freezes well, too. 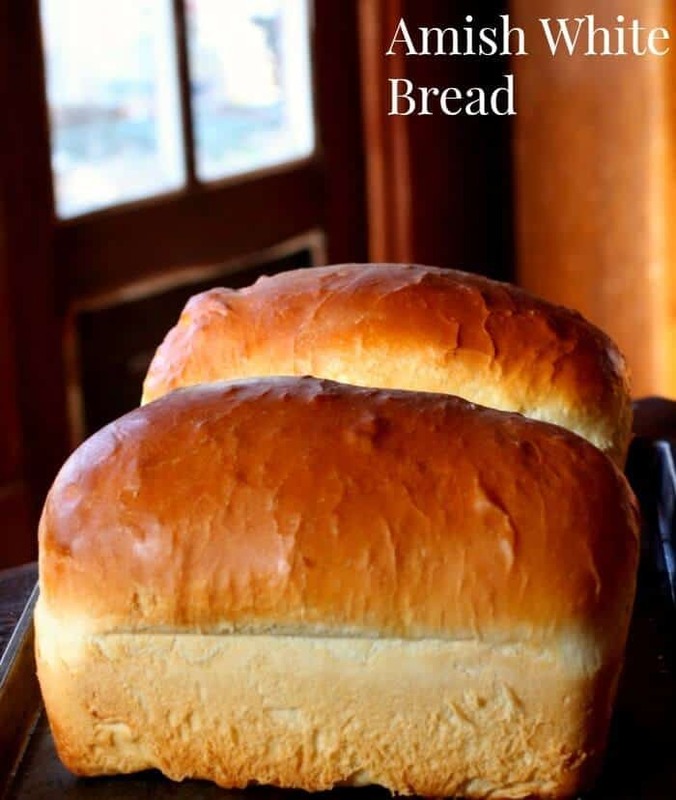 For this Amish white bread recipe you’ll need: whole milk, sugar, yeast, salt, coconut oil, bread flour, butter, two 9 by 5 inch loaf pans (measured from outside edge to outside edge. 1- 1/2 quart), and an instant read thermometer. You can find a list of bread baking tools and helpful information on the Essentials page. This recipe works best with bread flour but you can also use all purpose flour if you like. Just be aware that the texture will be a little more dense and your loaf will not rise as high. It freezes well, too. You can form this dough into dinner rolls, cinnamon rolls, hamburger buns… you can knead in up to 2 cups raisins, chocolate chips, or nuts… you can even roll it out, sprinkle with cinnamon and sugar, and roll it up for a gorgeous, buttery cinnamon swirl loaf. You’re going to love this versatile bread recipe! Amish white bread is a tender, fluffy loaf with a velvety texture. If you are looking for the homemade equivalent of Wonder Bread you’ll want to try this. It is somewhat sweet — and when I say somewhat I mean like those fabulous, hot dinner rolls they have at Logan’s Roadhouse or Hawaiian rolls. If you want something less sweet you can cut the sugar in half. It will change the texture a bit but will still be great. This is one bread recipe I don’t often use butter in. I use organic extra-virgin coconut oil because it adds just a little flavor to the bread. A light vegetable oil will work, too. Try it with coconut oil, light vegetable oil, and melted butter and just see what you like best. I honestly couldn’t tell you if Amish white bread is Amish or not. I do know it is really awesome good. I spent part of my childhood in Pennsylvania and was used to seeing Amish families driving their buggies to church, rolling hills dotted with white farmhouses and well ordered farms, and best of all (to me) those gorgeous quilts hanging on clotheslines. When I got older and did my stint as a fine artist people often commented on the intense colors I used in my paintings. It’s something I soaked up during those years. And of course the aroma of fresh breads and pastries, cakes and cookies, pies and tarts that wafted over the countryside like some kind of crazy incense. Several people have asked me how to knead bread by hand. I made this video – hope it helps. I use a Bosch to make bread with. I love my Kitchenaid but it just doesn’t handle bread as well as I’d like. If you plan on making bread often I’d recommend saving up for a Bosch. It lasts forever. You won’t regret it. Making homemade bread does take some practice but it is so very worth it! Many people have asked me if you “have” to use bread flour. The bread will rise higher and lighter if you do but you can substitute all-purpose flour if you must. I do not recommend it. You are going to love the sweet tenderness of this easy loaf! Once you’ve gotten some practice with this give the Buttermilk Cinnamon Swirl Bread or Rustic White Bread a try. Love this recipe? Give it a 5 star rating! 1/4 cup mild vegetable oil, — coconut oil works really well here! Dissolve the sugar in the warm water and milk in a large bowl. Set aside for 5 to 10 minutes, or until the yeast mixture gets foamy. Whisk in the salt and oil. With the mixer running add the flour, one cup at a time, until the dough pulls away from the bowl. Knead by machine about 5 minutes. If you are hand kneading mix in the flour until you have a sticky dough, turn the dough out onto a lightly floured surface and knead for 10 minutes or until the dough is smooth and elastic – adding flour as needed. Oil a large bowl and place the ball of dough in it. Oil the top of the dough and then cover with a damp cloth. Allow it to rise until it has doubled in bulk. This will take about an hour. Knead for three minutes or so and divide in half. Let rest for five minutes. Shape into loaves and then place in greased 9×5-inch loaf pans. Brush the tops with the melted butter. Let rise for 30 minutes, or until the dough has risen an inch or so above the pans. Bake at 350 degrees F for 30 minutes, or until loaves sound hollow when tapped. For a soft crust butter the tops and place a clean tea towel over the baked loaves as soon as you take them out of the oven. Let them cool for about 5 minutes and then take them out of the pans to finish cooling, covering them back up with the tea towel. Add ingredients to your bread machine in the order the manufacturer recommends. When the dough has risen once and second cycle of kneading begins, turn the machine off. Press “start” again to reset the machine. The dough will rise a second time before it bakes. It’s so good that way, too! Oh, I love these sweet, soft breads! I grew up in Ohio, and like you, remember the wonderful food we could shop for in “Amish country.” This bread looks gorgeous! You should! It’s so easy.. if you have trouble message me on Facebook and I’ll walk you through! Er’body needs a good white bread recipe. I just adore that touch of sweetness in a fluffy loaf. Can you use something else other than the coconut oil? Honestly, I don’t know. I don’t use a bread machine. We love homemade here at our house. This looks utterly delicious! I love this bread so much! Thanks! This bread is absolutely delicious! I NEVER made bread before until I saw this recipe a few months ago on line. It reminded me of my grandmother’s and for the first time in my life I decided I would try and make bread. My sister has taken over where my gram left off in our family. Plus, I have always been afraid to make bread because it is chemistry and it always scared me. The first time I made it, it was fabulous! I only needed 5 cups of flour. I read all the tips on here plus called my sister. I am sitting here now waiting for my second batch ever to cool down! I decided to make it for Easter Saturday instead of having my sister make hers for us. I use coconut oil just because I use it for so much in my cooking and was thrilled when I saw you could use it in this recipe. Give it a try! You won’t be disappointed. I actually have been researching Bosch machines because this recipe has me wanting to experiment and make more bread. There is nothing like the smell in the house and the taste of homemade bread is second to none. Good luck. Such beautiful loaves of bread, Marye. I’m sure your house smells amazing! Thank you so much, Joanie! As one who has lived in Amish Country for the past 7 years, I can definitely tell you this is an Amish recipe – what a gorgeous loaf of bread! While the buggies are quite fun to see, they can be rather annoying when they’re all on the road and you’re trying to get the kids to church – ha! Oh I remember! LOL! We lived in Warrington for many years but traveled through Amish country often… and my son in law is from Lebanon. It is a very fragrant loaf, for sure. Thanks. I know yeast baking is sometimes intimidating so I try to make it as approachable as I can. You make a beautiful loaf of bread Marye! I think you’ve mastered it! After 41 years of bread baking… I hope so! Thank you! The homemade equivalent of Wonder Bread?!? Yes, sign me up!! That white bread we all secretly love without the long list of nasty ingredients. Yea! absolutely! I mean, I grew up on Wonder bread… LOL! This bread looks perfect!! So fat and glossy. I can only imagine the aroma. Love fresh baked bread! I so adore freshly made bread. Yours looks super amazing and I can simply image how the kitchen fills with the aroma of the bread while it is baking. Love it! I’d love to make some french toast with this fabulous looking bread. Wow! I’m sorry it didn’t work for you.. It sounds like the yeast was past its prime or there was a problem with rising. Be sure not to try and force all the flour. I live in a very humid environment and bread will take less flour, especially if I am using white bread flour as opposed to all purpose white. First time I poured the unused flour back into the bag, I freaked but then read about the humidity thing and relaxed. I used to do my bread baking years ago in the Midwest in winter and am now in Florida and have begun baking all the time. Thank you, that is great to know! So you still have to hand knead this dough even after kneading it for 5 minutes with my dough hook on the mixer? It depends. I like to give it a few turns by hand just to check that it’s well kneaded especially important if you are using a KA and not a Bosch. No it can’t. It needs the gluten in the flour to rise properly. Can I use plain flour instead of bread flour? 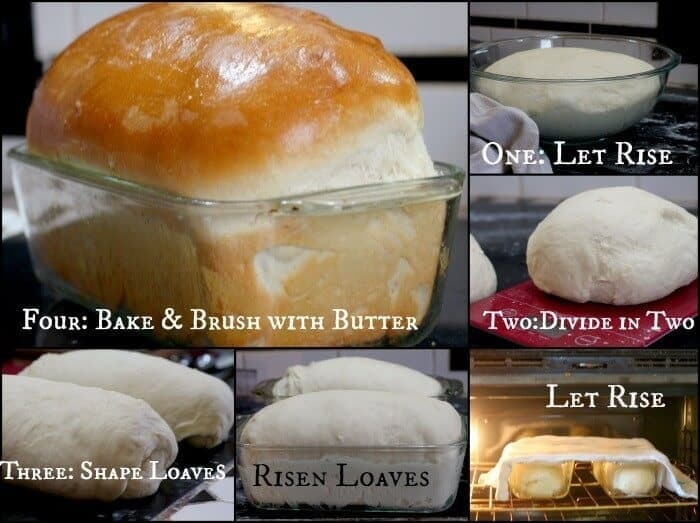 I love making my own bread, so much better than store bought – can’t wait to try this, it looks perfect! Beautiful loaves! Very close to the bread my Mennonite grandmother made every week. My sister is an avid baker and makes bread all the time. Our babczi taught her and she started out using her recipes. I have always been afraid to work with yeast and my sister would always tell me to not be afraid of it and to give it a try. I am a great cook but tend to shy away from baking. This recipe came up on my Facebook newsfeed last week. I use coconut oil all the time and when I saw I could use that in this recipe I decided to try to make bread for the first time. I bought bread flour and yeast and decided I had nothing to lose. OMG! I cannot believe how easy it was and don’t know why I have been so afraid to make bread. This recipe tastes exactly like the bread out babczi made every Easter. My daughter LOVED it, as did all of us. I am going to make another batch today. I read all of the tips on here as well as talked to my sister, and it made my first bread making attempt go a lot easier. LOVE this recipe! And, it is so easy. Thanks for letting me know Dianne! I am so glad. 🙂 right? It makes the house smell good, it tastes good, it looks good, and it’s satisfying to make. Yum!